Mariachi507 asked the Answer Line forum about a boot time error message trying to load a non-existent .dll. Chances are this annoyance is left over from something you removed--either a program you uninstalled or some malware cleaned up by your security software. Assuming your computer is otherwise running fine, the error message is probably less harmful than the actual .dll. Of course, things would be better still if you didn't get the error message. 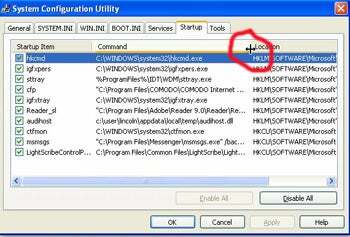 To remove it, select Start, type msconfig (if you're using XP, you have to select Start, then Run, then type msconfig) and press ENTER. Click the Startup tab. Look for the delinquent .dll. If it's not listed in the first column ("Startup Item"), expand the Command column and look there. To expand the column, drag the little vertical line between Command and Location to the right. Once you find it, uncheck it, click OK, then Restart. You shouldn't see that error message again.